Each Burpee terminates with a jump to touch a target 1 foot above max standing reach. 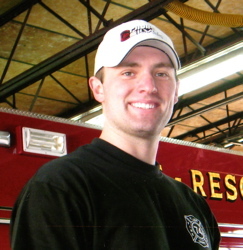 Add a video for "Ryan"
Maplewood, MO Firefighter, Ryan Hummert, 22, was killed by sniper fire July 21, 2008 when he stepped off his fire truck responding to a call. The "Ryan" Hero WOD was first posted on crossfit.com as the workout of the day for Wednesday, October 8, 2008 (081008).